You've got The Naked Chef aka Jamie Oliver and now you've got The Lazy Chef aka moi. I love to eat. I love to cook. What I don't love is slaving for hours in the kitchen to produce a meal which was exactly what I did yesterday for a subpar mushroom lasagne. I won't be cooking that dish again. EVER. I believe it should take no more than 30 minutes to create tasty dishes with simple and fresh ingredients. Better still, I love recipes that call for chucking all the ingredients into a pot and simmer for an hour or so while I get on with work. Any recipe that lists ingredients as long as my arm is instantly ignored. Who wants to race around to every grocery store to find some obscure herb or vegetable? Not to mention the chopping, mincing, saute-ing followed by a long simmer and then baked for an hour, remove foil and bake again. Whew! I feel like I've just ran a marathon in the kitchen just reading what I wrote. 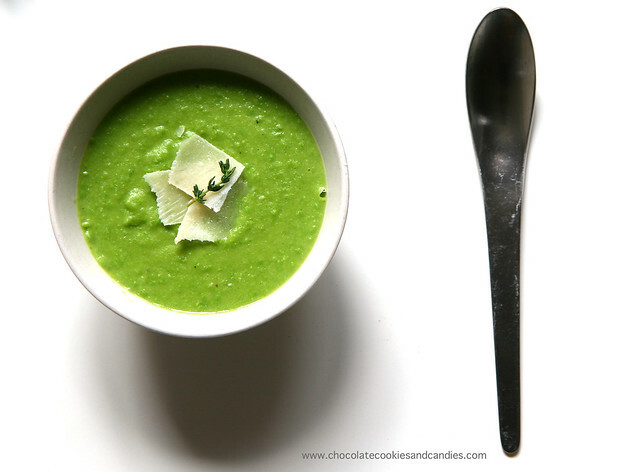 This is my version of the pea and potato soup which was what I put together from whatever I've got in the pantry and freezer. It's a delicious and nutritious meal which can be whipped up within minutes and require very little work. 1. Melt the butter in a pot. If you're worried about your muffin top but love the taste of butter, chuck it in. Worry about the love handles tomorrow. Next, add the onion and potatoes. Cook till both have softened. It takes about 5-6 minutes. 2. Now toss the thyme and garlic into the pot. Saute for a few minutes and remove thyme. 3. Pour in 100ml of water and cook for another 3 minutes or so. 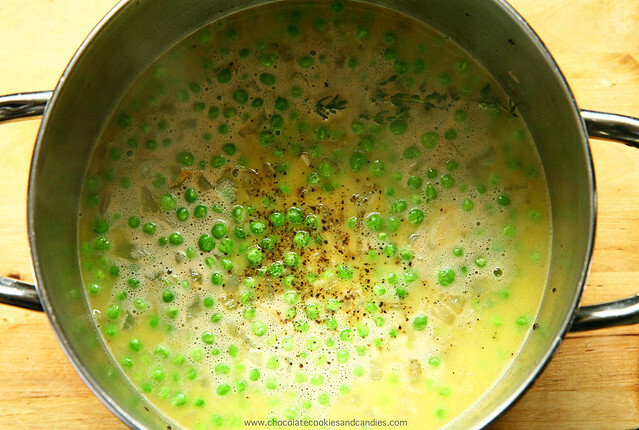 Add the frozen petit pois and fill the pot with enough water to cover the peas. 4. 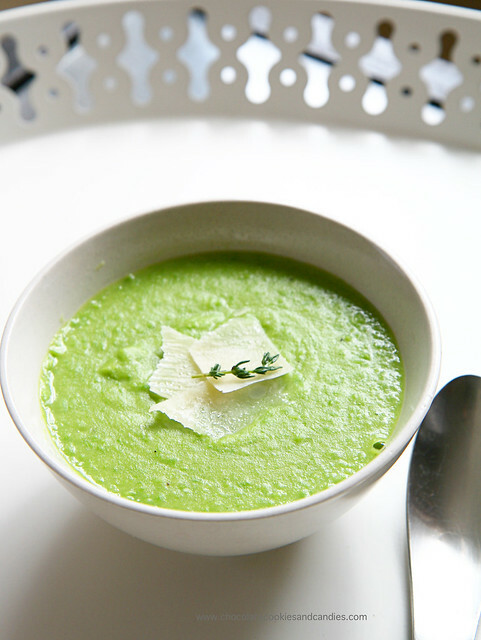 Bring it to boil and blitz into a puree. Tada! Simple, eh? Yum, Yum, Yum!!!! I am the queen of lazy cooking so this is perfect. Plus, I love how vibrant the color of the soup is! Very fashionable for soup, no? And, i've always wondered why they call Jamie Oliver the 'Naked Chef'. I mean, he never gets naked. That, my friend, is false advertising :) Hehe, thanks for sharing the recipe! This looks light and delicious and the lazy cook is the right "cook" for me! I like cooking. I think cooking is therapeutic but I don't like to deal with long list of ingredients and complicated prep. I love soups and stews, especially after a German friend taught me this trick: 1) Sauté onion (with ginger and garlic as desired) in oil/butter, 2) add two potatoes, 3) add anything else + water (and broth if on hand). Last--at the very end--pour in some cream. The cream is the magic part--it makes every combination work. Yum - we eat a lot of soup, too! I love it because I always make enough for leftovers the next day. Sharon, LOL!! I remember reading somewhere that apparently Naked chef meant stripping down the recipes/cooking down to the basics. Kat, I can't fathom why anyone wants to stay all day in the kitchen unless if the person works full time as a chef! AA, I'll definitely try that. The weather's so cold, I want to eat soup all day. lauraloo, you're like me too! I try to make a huge batch so that I can just heat it up for lunch the next day. Um... YUM! And AMAZING!! I saw the recipe and basically thought, "Forget it. Looks good so must be complicated." Sam, I'm so pleased that you and hubs like it! !